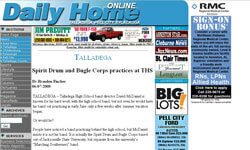 Spirit's pre-season training at Talladega High School (THS) in Talladega, Ala., drew the attention of locals, and a reporter from the Daily Home. THS band director David McDaniel spoke highly of what he's been able to learn from watching the instructional staff of Spirit while the corps rehearsed on the high school's campus. Read the article at DailyHome.com.